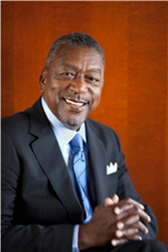 Robert L. Johnson is the Founder and Chairman of The RLJ Companies, an innovative business network that provides strategic investments in a diverse portfolio of companies in hotel real estate investment, private equity, financial services, asset management, automobile dealerships, sports and entertainment, and video lottery terminal (VLT) gaming. In July 2007, Johnson was named by USA Today as one of the 25 most influential business leaders of the past 25 years. RLJ Lodging Trust is a self-advised, publicly traded real estate investment trust (REIT) focused on acquiring premium-branded, focused-service and compact full-service hotels. RLJ Lodging Trust is one of the largest U.S. publicly-traded REITs with 125 properties, with approximately 20,800 rooms, located in 21 states and the District of Columbia. RLJ Equity Partners, LLC was founded together with The Carlyle Group and specializes in middle-market leveraged buy-outs, leveraged recapitalizations, and growth equity. RLJ Equity Partners’ strategy is to make control investments in companies with enterprise values between $50M and $250M within aerospace/defense; automotive/transportation; business services; consumer/retail; and general industrial sectors. RLJ Equity Partners has 10 portfolio companies. RLJ Credit makes senior debt and subordinated debt investments in lower middle market companies. RLJ Credit provides flexible capital solutions to facilitate buyouts, recapitalizations, refinancings, and growth initiatives. The principals of RLJ Credit have extensive experience partnering with middle market companies, across a broad range of industries, to support growth and create value. RLJ Credit partners with private equity firms, investment banks, and operating executives to deliver a full range of financial and strategic resources. RLJ Entertainment, Inc. (NASDAQ: RLJE) is a premier independent owner, developer, licensee and distributor of entertainment content and programming in primarily North America, the United Kingdom and Australia with over 5,300 exclusive titles. RLJE is a leader in numerous genres via its owned and distributed brands such as Acorn (British TV), Image (feature films, stand-up comedy), One Village (urban), Acacia (fitness), Athena (documentaries) and Madacy (gift sets). These titles are distributed in multiple formats including broadcast television (including satellite and cable), theatrical and non-theatrical, DVD, Blu-Ray, digital download and digital streaming. Via its relationship with Agatha Christie Limited, a company that RLJE owns 64% of, RLJE manages the intellectual property and publishing rights to some of the greatest works of mystery fiction, including stories of the iconic sleuths Miss Marple and Poirot. RLJE also owns all rights to the hit UK mystery series Foyle’s War. RLJE leverages its management experience to acquire, distribute and monetize existing and original content for its many distribution channels, including its branded digital subscription channels, Acorn TV and Acacia TV, and engages distinct audiences with programming that appeals directly to their unique viewing interests. Through its proprietary e-commerce web sites and print catalogs for the Acorn and Acacia brands, RLJE has direct contacts and billing relationships with millions of consumers. RLJ Financial, LLC was created by Robert L. Johnson as part of his financial initiative to “end payday lending as we know it today” and to reshape the current lending climate by encouraging financial institutions and regulators to create lower interest borrowing solutions that provide transparent and responsible lending products to consumers, particularly to individuals in need of short term and emergency borrowing. RLJ Financial believes that lower interest rate solutions and accessible financial literacy will bring about a significant change to improve the financial lives of millions of working class Americans and consumers who rely on payday and other lending alternatives. Retirement Clearinghouse (RCH) is the leading specialist in employee retirement transition (job changer) services, with best practices designed to improve outcomes for retirement plan sponsors, participants, and providers. RCH’s programs increase plan assets, improve plan efficiency, lower plan costs and reduce fiduciary risk while providing participants with one-on-one, beginning-to end assistance in the complex process of consolidating and managing their workplace retirement savings accounts. In keeping with its commitment to ease of use, RCH works with sponsor’s existing recordkeepers and conforms to existing plan rules, requiring no major plan changes. RCH has streamlined more than 10,000 sponsor plans, helped more than 625,000 participants, guided billions of dollars in transactions, and reduced cashouts. RCH’s experienced management team has a long record of thought leadership and innovation in the retirement savings industry. An RLJ company, RCH is based in Charlotte, NC. RLJ Fixed Income, LLC is a global fixed income platform, specializing in fixed income investment opportunities within the government, corporate, federal agency, and municipal bond markets. Created by Robert L. Johnson, founder and chairman of The RLJ Companies, RLJ Fixed Income, LLC actively identifies and invests across all fixed income asset classes. RML Automotive is headquartered in Little Rock, Arkansas and consists of 35 automotive franchises and three Harley-Davidson motorcycle dealerships across the South Central, Southeast, and Midwest regions of the country. RLJ-McLarty-Landers was ranked 19th on the Automotive News annual list of "Top 125 Dealerships in the U.S." and is the largest African American owned automotive franchise in the country. Charlotte Hornets is a professional basketball team and member of the National Basketball Association (NBA). In 2010, Bob Johnson sold majority ownership of Hornets predecessor, Charlotte Bobcats, to Michael Jordan and MJ Basketball Holdings, LLC. Johnson retains a minority ownership interest and serves as the Hornets’ governor to the NBA. Caribbean CAGE, LLC is a route-installed gaming company headquartered in Puerto Rico that focuses on the installation, operation and management of video lottery terminals (VLTs), linked gaming systems and game content throughout the Caribbean and Latin America. CAGE has entered into several strategic alliances to install and operate VLTs in targeted Caribbean countries with the goal of enhancing local economies and employment opportunities. Alright TV is a groundbreaking digital channel that revolutionizes faith friendly content viewing. Featuring premiere talent along with rising stars, Alright TV offers the best in feel-good, value based entertainment that inspires and motivates. Alright TV brings buzz-worthy comedies, talk, reality, music, and the streaming of national Sunday church services. Developed by Robert L. Johnson, founder and chairman of The RLJ Companies and Tracey E. Edmonds, President and COO of Our Stories Films, Alright TV is a digital collaboration with YouTube that includes an array of online productions and entertainment. The RLJ Kendeja Resort & Villas is a 78-room villa style hotel located on 13-acres of ocean front property overlooking the Atlantic Ocean outside of Monrovia, Liberia. The four-star luxury resort is the first of its kind in Liberia and one of the first in all of West Africa. Construction began in March 2008 and the resort property opened in June 2009. Prior to forming The RLJ Companies, Mr. Johnson was founder and chairman of Black Entertainment Television (BET), the nation’s first and leading television network providing quality entertainment, music, news, sports and public affairs programming for the African American audience. Under Mr. Johnson’s leadership, BET became the first African American-owned company publicly traded on the New York Stock Exchange. In 2001, Mr. Johnson sold BET to Viacom for approximately $3 billion and remained the Chief Executive Officer through 2006.